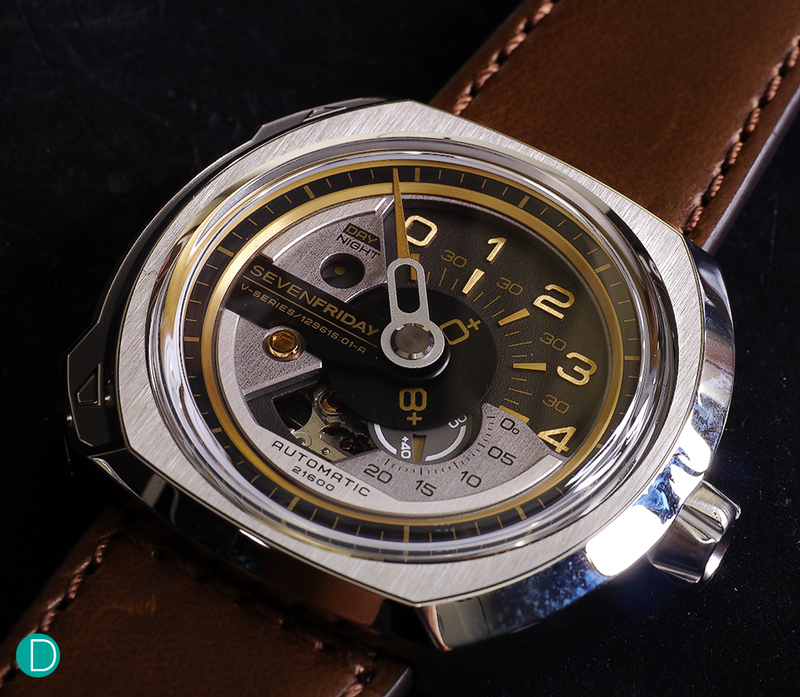 SEVENFRIDAY is a rather young, hip, and non-conformist watch company. Born in Zurich in 2012 with a design studio in Bienne, the upstart is one of the first watch companies to aggressively use social media to promote their watches. They have already established themselves in the field with their first two watches: the P-Series and the M-Series. And their latest is the V-Series, which we review here. 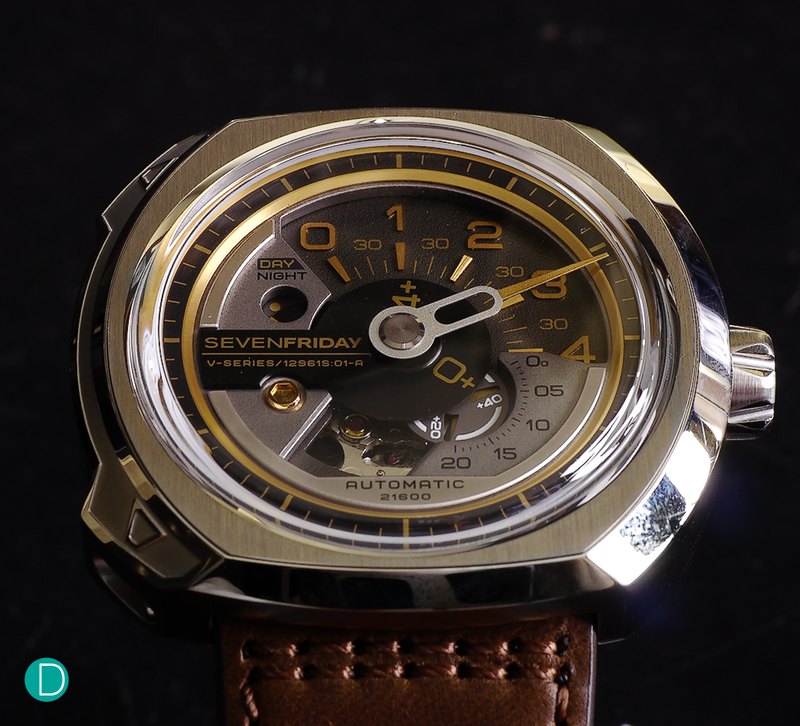 As this is our first article on SEVENFRIDAY, we begin to tell a bit on the historical series. They began with the P-Series. 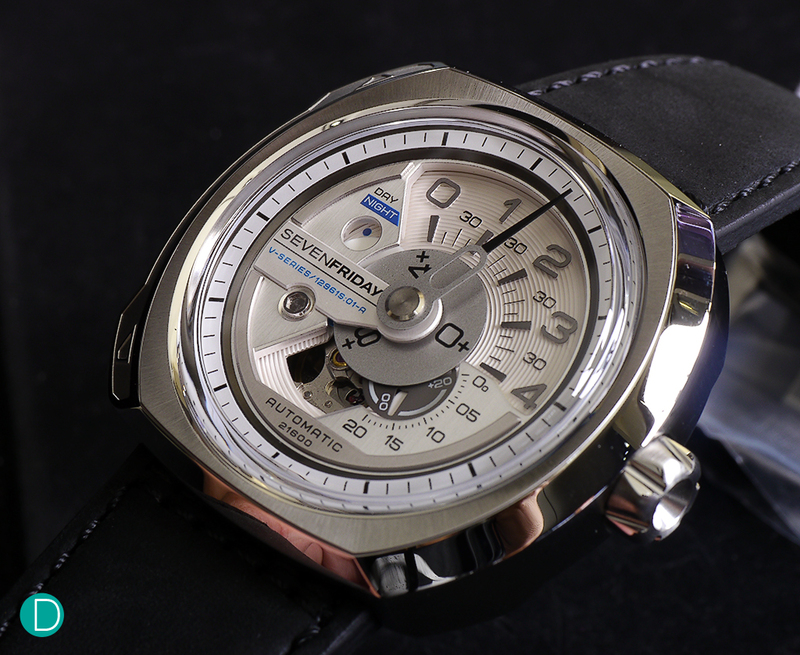 The P-Series featured a lugless, square case (approximately 47mm) with rounded edges, and a visually powerful dial design. The minute hand extends from a spoked wheel in the center, and extends out to indicate the minutes. The hour hand is somewhat below the minute hand. And a subsidiary seconds hand and a 24 hour hand dials sit below the hour hand. Not a model of legibility, but conventional in a bold, artistic way. It carried a Miyota movement. And a CHF 925 price tag. Bold. Daring. And quite disruptive. They followed up with the M-Series with rotating rings showing the time instead of hands. 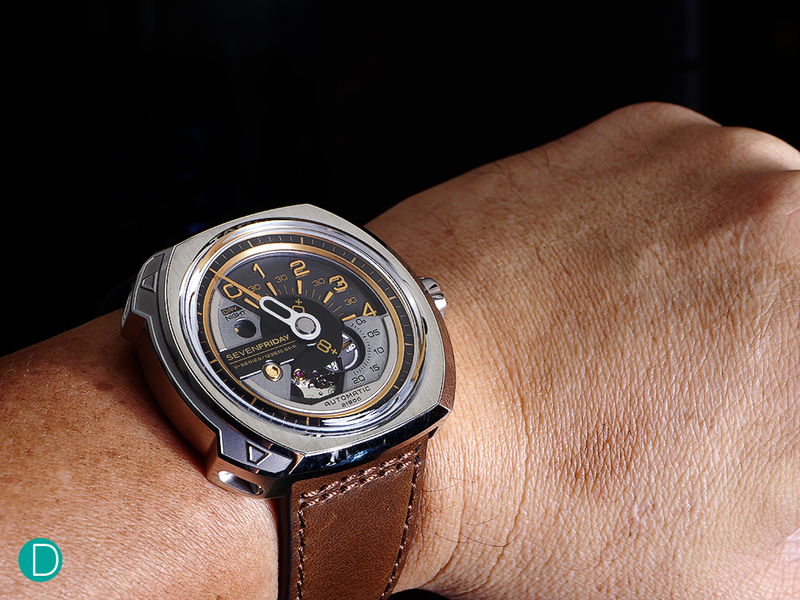 Another Miyota movement powers the watch. And the same rounded square lugless case is used. As with the P-Series, the base is a steel case, with combinations of anodized, pvd and gold anodized finishing. Two models are initially launched. Both with a stainless steel case with sunray brushed top bezel, but one with a white and blue dial, and another with a black and bronze dial. SEVENFRIDAY V1 on the left and the V2 on the right. The V-Series dial carries quite a bit of text. However, distinctly less than the rather superfluous texts on the P-Series and the M-Series. The V-Series moves on from the rounded square lugless case, and is built on a rather more sophisticated and complicated case design. 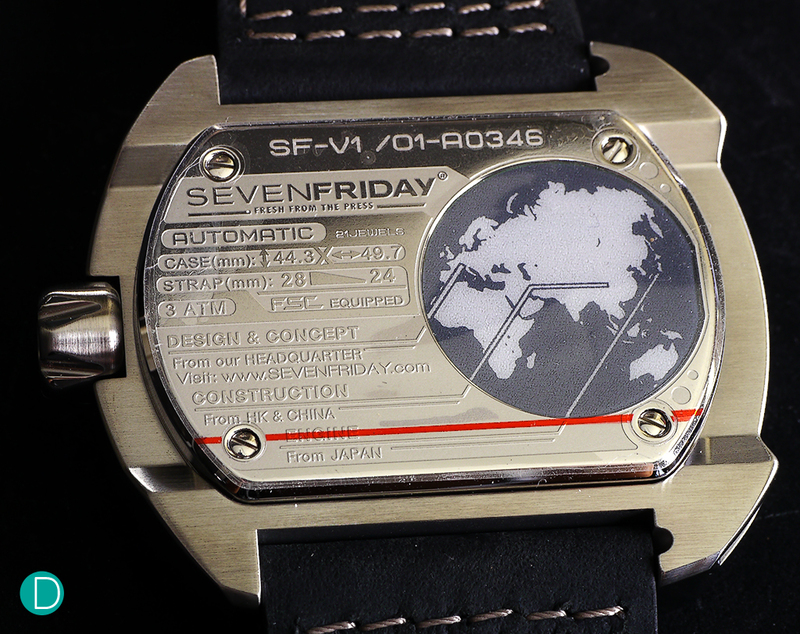 SEVENFRIDAY V2, showing the rather more sophisticated case design. Note the two protrusions on the left of the case at 10 o’clock and 8 o’clock. This houses the spring loaded buttons for the FSC (Fast Strap Change) system. There are two protrusions on the left side of the case. This houses a patent pending Fast Strap Change (FSC) system. A spring loaded button is hidden within each of the protrusions. Push with a toothpick or a sharp instrument, and it releases the strap. Clever. The caseback, showing the world map. Below the map is the NFC (Near Field Communications) chip which allows the watch to be authenticated and registered with SEVENFRIDAY for after service and community features. That’s not the only clever feature on this watch. It also features a smart chip, embedded in the caseback. The chip is embedded in the blue plastic world map, and uses NFC (Near Field Communication) technology. We first saw the use of NFC technology in the Bulgari Diagono Magnesium Wrist Vault which we reviewed here.The application here on the SEVENFRIDAY V-Series is rather similar. This chip allows the watch to be authenticated with the SEVENFRIDAY mobile application, assuring the owner that the watch is not a fake. 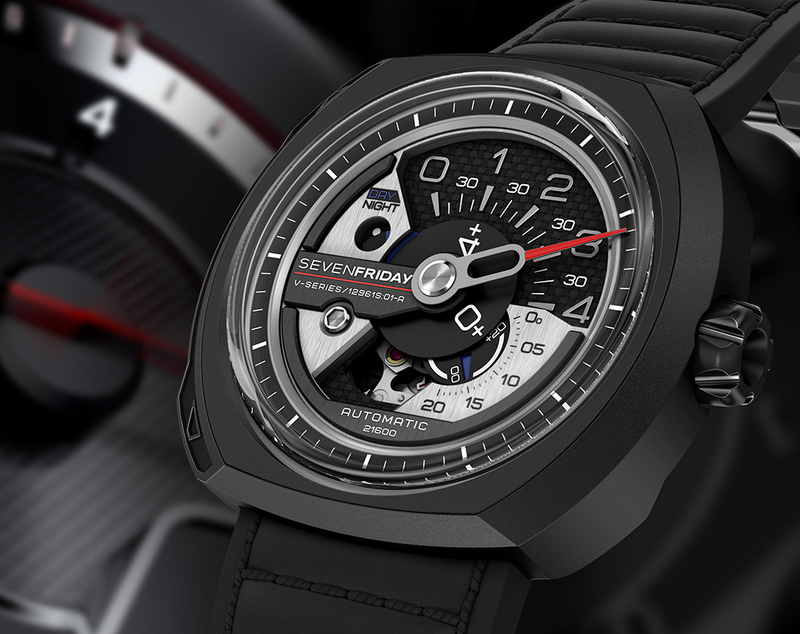 The app is available on Apple App Store or Google Play, and can be used to register the watch with SEVENFRIDAY. Eventually, the company assures that they will roll out other useful after sales services and community features for registered owners. Very clever. We then come to the dial. And the reading of the time. A bit more convoluted. But SEVENFRIDAY is known for being bold and disruptive. And so is the dial design. The dial detail of the V2, showing the 120° angle hour reading. And the additional turning disc. The time is now 5:11:25 am. 4+1 gives the hour. And the minute hand is conventional, making a full 360° turn, showing just past 11 minutes. And the seconds is indicated by the turning disc +20 and 5 giving 25. The time reading is very unconventional and not intuitive. It requires one to have some fundamental arithmetic skills. The hours are shown by a turning disc. On this disc is marked 0+, 4+ and 8+ at 120° intervals. This markers is the hour hand, so to speak. The disc rotates like a typical hour disc, and the markers points on a similarly marked 120° scale with the numbers 0-4. Add the two and you get the hours. In the dial above, 4+1 = 5. The minutes are conventional, and rotate a full 360°. In the case above, it is just past 11 minutes. And the seconds is read on the small rotating disc, marked +0, +20, +40, turning to point at a corresponding 120° marked scale of 0-20. In the example above, the disc +20 points at 05, indicating that it 25s past the minute. Full time as shown above: 5:11:25 am. The Day Night indicator on the left of the dial is dark indicating that it is night. 40H power reserve, The movement can be seen peeking out from an aperture, and looks completely unfinished. The watch, as mentioned, is designed in Bienne, but made in China. Having mentioned this, Made in China does not necessarily mean low quality. The build quality is rather good. The case parts fit well, the specified finishing executed well. The dial, as can be seen has a texture which is rather pleasing. The V2 measures a rather large 44.3mm x 49.7mm, with a 12.85mm thick case, but happily it sits well on the wrist. Shown below on the author’s 7.5″ wrist. SEVENFRIDAY V2 on the wrist. The overall package is rather interesting. 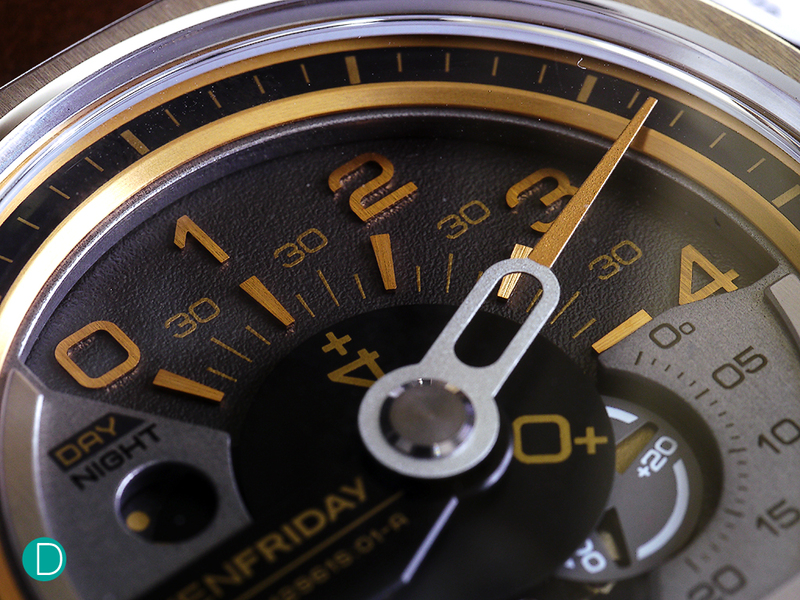 As we mentioned, typical characteristics of SEVENFRIDAY. Bold, Daring. Disruptive. And attractively priced at CHF 1055 without taxes, and S$1778 with Singapore GST. Should be a big hit. We carry news of the V3! Announced today, October 21, 5pm CET, is the new V3. With a black PVD finish, similar to the very popular P3-01. Here is the first picture of this new release to be published. Bold has become even bolder. 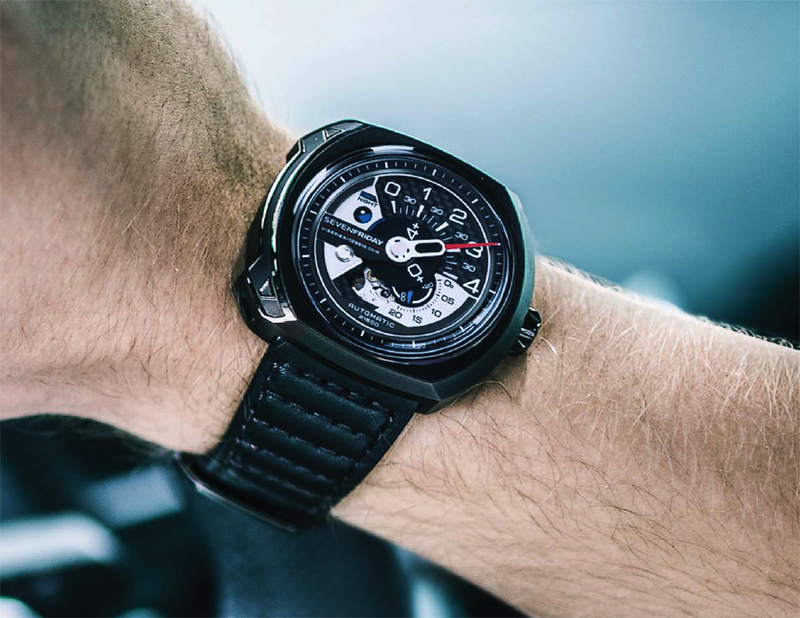 The black finish with the red minute hand is very attractive and legible, reminiscent of a car’s tachymeter or speedometer, as depicted in the background of the picture below. SEVENFRIDAY V3. Black PVD finish. Pic: SEVENFRIDAY exclusive pre-release for Deployant. And on the wrist. Priced at CHF 1135 before taxes. SEVENFRIDAY V3 on the wrist. Pic: SEVENFRIDAY pre-release to Deployant.